"I had an album coming out (with a) $1.5 million marketing budget...I put the whole budget on one song, (thinking) "It's a number 1.” And the record tanked...I wish somebody would have explained the importance of budgeting that money." 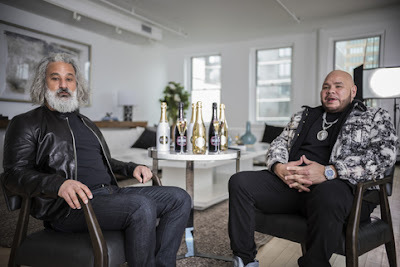 Luc Belaire's acclaimed series "Self Made Tastes Better" continues with hip hop legend Fat Joe. The Latino rapper and actor was raised in NYC’s South Bronx neighborhood and has gone on to become one of the world's leading hip hop artists. Despite his mega fame, Fat Joe (real name: Joe Cartagena) always embraced his Hispanic heritage, becoming a role model for urban youth. In this interview, Fat Joe discusses how he learned the ways of the street, respecting the pioneers, wasting $1.5 million on a single record (and millions more on private planes and jewelry) and learning how to sustain himself as one of the biggest and most consistent names in hip hop by making wiser business decisions. Fat Joe remembers Jay-Z and Diddy "they had a business plan, they had a structure... they only LOOKED like they were partying." In keeping with the spirit of our "Self Made" series, last year Joe launched a sneaker initiative in to improve student performance in NYC public schools. Students at four schools in the Joe’s neighborhood, the Bronx, were measured on improvement; the class rated “most improved” received free sneakers for everyone in the class. Joe recently announced “round 2” of the popular contest this year, and encourages other celebrities to join him to take the program city-wide. Fat Joe joins globally renowned music artists like Trina, Eve, Fabolous, G Herbo and more in the second season of Belaire's "Self Made" campaign. Luc Belaire is a premium brand produced in France - the hallmark of quality in the world of fine wines. Our 5th and 6th generation father-and-son winemakers oversee production of each bottle of Belaire at their maison in Montagny-les-Beaune, established in 1898. The line includes Belaire Gold, made in Burgundy from a blend of Chardonnay and Pinot Noir along with a cane sugar dosage, alongside Belaire’s top-selling cuvée Belaire Rosé, a unique sparkling Rosé wine from the south of France crafted from a blend of Grenache, Cinsault and Syrah grapes – the three favorite Rosé grapes of the region – and Belaire Luxe, an elegant ‘blanc de blancs’ made exclusively from Chardonnay with a special dosage made from prized Chablis grapes in Burgundy. The newest addition to the range is Belaire Luxe Rosé, made at Belaire’s estate in Provence from a classic blend of rosé varietals and a unique addition of oak-aged Syrah. Finally, Belaire’s Fantôme (French for phantom) range houses each of its cuvées in a luminescent bottle which lights up at the touch of the button. Sovereign Brands is a family-owned, international wine & spirits company headquartered in New York. The company is owned and operated by the Berish family and partners with first-class producers from the world's most iconic wine and spirit regions to develop superior brands. Sovereign has a portfolio of successful brands including Luc Belaire, a smash-hit line of French sparkling wines, which has earned global acclaim for its exquisite taste and striking packages, and is available in more than 100 countries around the world. The company’s portfolio also includes the brand-new McQueen and the Violet Fog, an extraordinary gin from Jundiaí, Brazil, Bumbu, a craft rum brand from Barbados that ranks among the world’s most critically acclaimed rums, Cloud Chaser, a classic French Côtes de Provence Rosé, and Skeleton Vineyards, a range of accessible wines from Argentina and Austria.